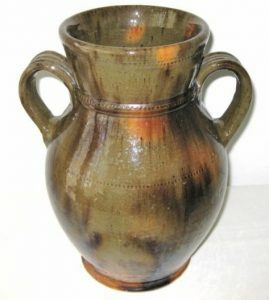 A superb Jacob Medinger two handled vase in a nice large size – 11″ tall. Excellent form and colors – pumpkin orange base with large areas of green and splotches of manganese. Typical Medinger decorative tooling work. Excellent condition – no chips, cracks, etc. This is a beautiful Delftware tankard with a pewter lid. 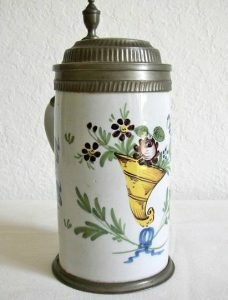 It is probably of Dutch or German origin, and dates from the late 18th to the early 19th C. It has an attractive polychrome cornucopia decoration and is in overall good condition. There is a small age crack at the top of the handle. 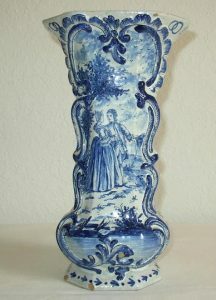 A very large and beautiful Dutch Delft vase from the later 18th C. Wonderful decoration showing a couple in a landscape contained within a lovely scrolled cartouche. It is also heavily decorated with garden elements, including insects, flowers, leaves, vines, etc. A beautiful large example in fine condition with no hairlines, cracks or restoration. Has an unidentified maker’s mark on the bottom. 12 3/4″ tall. 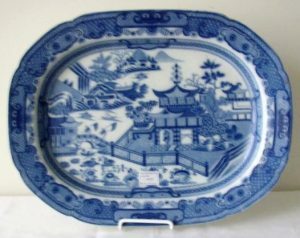 Very decorative English Staffordshire blue and white serving platter in the Chinese taste. A clear sharp pattern in pleasing shades of blue surrounded by a very pretty border. Excellent condition with normal usage wear on the back. Only mark is an impressed small 8 lobe asterisk form 3/16″ across. The platter is 17.5″ by 13 1/4″ by 2″ deep. 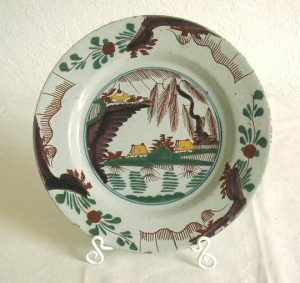 A very nice polychrome 9” Dutch Delft plate from the 18th C. It has an Oriental pattern with greens, browns and yellow on a white ground. There is some edge fritting which is usual in Delft, and no hairlines or major chips. 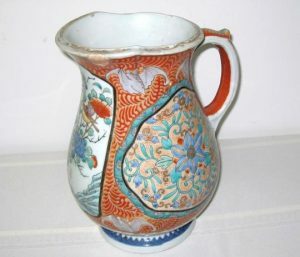 Very large and heavy Oriental water pitcher with nicely done floral and bird polychrome decoration (and maybe 8 bats) along with gold highlights, 11″ tall. Probably later 19th C. No markings as to maker or origin. Very good condition with only 2 minor spout chips from use – 1 is an old small flake off the lip’s edge (about 2/4″x3/4″), the other, also a flake like chip, has an old repair and inpainting (about 7/8″x5/8″). The repair is visible in the photo. No hair lines or cracks. 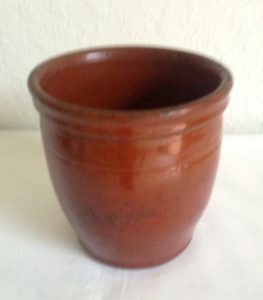 Signed “John W Bell” “Waynesboro” Redware Jar. Excellent original condition – no chips, cracks, etc. 5 3/8″ tall, 5 1/4″ diameter. Lighter orange color. 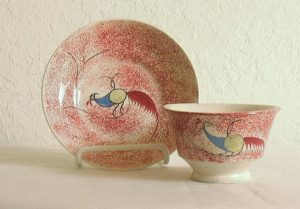 Pea Fowl decorated handleless cup and saucer with red spatter ground, mid 19th C. Very fine condition with no damage or restoration. A nice clean example. Saucer is 5 5/8″ diameter. Cup is 2 1/2″ high. 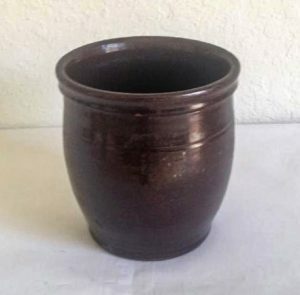 Signed “John Bell” “Waynesboro” Redware jar. Excellent original condition – no chips, cracks, etc. 5 5/8″ tall, 5 1/4″ diameter. Darker chocolate glaze color.